Friendship is important to aging dogs & cats. People are living longer than ever and so are their pets. Many believe that longer lives are responsible for the rise of dementia in people, as well as in our pets. Yesterday, I wrote about ways you can delay or prevent cognitive dysfunction in your dogs and cats, but what if telltale signs are already showing up? Veterinarian Shawn Messonnier of PetCare Naturally, says that one out of four dogs and cats over the age of 7 have a cognitive disorder similar to Alzheimer's in humans. If you see any of these signs, you should immediately take your pet to a veterinarian to get a medical diagnosis, as your pet could have a physical ailment that is responsible for any of these behaviors. Physical problems can mimic or exacerbate symptoms of dementia in pets, so make sure those are treated first. Because some drugs can have more serious side effects than the disease they are treating, I would get advice, and possible treatment, from veterinarians who practice natural or eastern methods of treatment. While there is no cure for dementia in dogs or cats, there are just a few medicines which may be prescribed by your vet after ruling out other possible causes of your pet's symptoms. The most effective drug found to date, is one used in humans for dementia, Parkinson's disease, and even depression. It's called selegiline or “Anipryl,” and it is also often prescribed for Cushing's disease in dogs as well as dementia. But selegiline can have some very negative side effects that may be worse than the symptoms of the disease, so you will have to watch your pet carefully during administration of this drug, and keep in close contact with your vet. 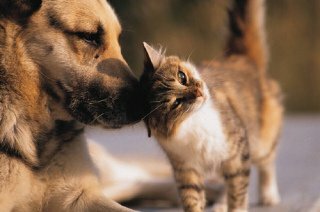 Natural medicine veterinarians may offer other recommendations that have helped some dogs and cats re-establish some routine behaviors. I took two of my dogs to a veterinary acupuncturist when they developed dementia late in their lives and that, along with Chinese medicinal herbs, also prescribed by the veterinarian, helped to calm them. My pet insurance even covers those treatments. If you haven't already changed your pet's diet from kibble and canned to fresh and natural wet food, it's time to do it. Nothing provides more immediate and pure nutrition than a raw food diet for pets. It's better for their brains and better for many ailments that come with old age. So get your pups and kitties off the grains and the fillers and the supplements that should come directly from the food source - chicken, beef, seafood... whatever your babies like - but fresh and raw - not processed. If it's difficult for your cat or dog to digest raw meat, you can cook it, but don't give them cooked bones or anything that they can choke on; you can try grinding the meats before you decide to cook them. Cats need more meats and fish than dogs. Cats are carnivores, so their diets should be very high in proteins. Read more about raw diets for older cats at Healthy Pets. Their meals will need to be supplemented (see below) with a few items that will help improve failing health. For dogs, you can feed them less protein and more vegetables if you like, as dogs are omnivorous. You will want foods especially high in B vitamins and vitamin C and supplements, as well. Check out DogsNaturally to find more information about raw diets for dogs. See diet recommendations in Helping to Prevent Or Delay Dementia In Dogs & Cats. Beyond the vitamins and minerals accessible to your pets through their raw diets, there are special natural supplements that they will need to support their brain health. One that I am very pleased with is called Cholodin which has been studied and recommended by veterinarians for use in dogs and cats with cognitive dysfunction and/or seizures. The primary ingredient is choline, a B vitamin. Dr. Messonnier, referred to above, has had impressive results treating older dogs and cats with Cholodin, but he says the secret is to start the supplement before the signs of dementia appear. "Many pets taking choline supplementation will not develop signs of Alzheimer's disease (cognitive disorder.) Cholodin is safe, inexpensive, and has no significant side effects," says Dr. Messonnier. Customers of Cholodin could not agree more that the supplement works; many say it actually reverses symptoms of cognitive dysfunction in their pets. So even if you didn't start early, it's really worth starting now! Cholodin is available for dogs and cats. Humans, eat plenty of beef liver! (See choline). Liver disease is a common co-disease factor in dementia, mainly because of the pet's age, and you will need to insure the health of the liver. Many veterinarians and nutritionists recommend you supplement with SAM-e for liver support. Depending on the size of your pet and the amount you need, you can find a selection of SAM-e here. Neutricks contains a calcium-binding protein, Apoaequorin, that has been shown to improve cognitive decline in dogs and cats. That is the same active ingredient in the human product, Prevagen. Senilife has some benefit to dogs and cats, even though it is supposedly made for elderly dogs. This product is high in antioxidants and protects the neurons in the brain. Once you make positive changes in diet, medication, and supplementation, your dog or cat may be ready to resume some activity. Keep taking your dog for walks and play with her, even if you have to use food treats to motivate. The puzzle toys I cited in my blog on preventing or delaying cognitive decline are just as relevant to challenge your cognitively-declining pet. If they are too difficult you can make up your own or get some good ideas from 50 Games To Play With Your Cat, and How To Teach Your Old Dog New Tricks. Interaction with your pet should occur as frequently as possible. Pets with dementia will back away from their owners and want to remain alone. They might not recognize you. Don't take it personally; that's what happens. You will need to engage them in some activity, even if it is snuggling or petting. But best to try to get them involved in an activity - any activity would be good. Ideally, you need to keep them as occupied as possible during the day. As pets with dementia tend to confuse day and night, their nights are often spent roaming and wandering their surroundings, sometimes howling; they are afraid. If you keep them busier during the day, you will have better luck getting them to sleep at night. Keep your pets somewhat contained when you are not with them so they won't hurt themselves. One room, a large closet, or large crate is ideal for night-time, so they can't wander too much. Ask you veterinarian if a mild sedative can be used if night wailing is a problem. The desire to socialize with other animals or people, even their owners, sharply declines with dementia. It is one of the first things to decline. Many times anxiety and fear are behind this withdrawal, and if you have made changes to diet and continue to exercise your dog and play with your cat, that may lessen the distance she feels from you. If you have two pets or more, they may be some comfort to your older pet (a cat and a dog couple may be the best match if they were friends previously) - or the healthy pet may become jealous. Jealousy among pets will consume more of your time, and it will be important to find time and energy for both pets. In my experience, younger cats have become aggressive with an older, sick cat, so you may have to separate them. This is a time when you will need support from your friends and family, as well as your veterinarian to find good, workable solutions. But, there is hope! All the measures an owner takes to prevent or delay cognitive dysfunction in their pets - proper diet, physical exercise, mental stimulation, and socialization - must be continued, although modified for the pet's age and particular physical disabilities. And the recommendations for human Alzheimer's patients are the same! University of California, Irvine professor of neurobiology and neurology and director of Alzheimer's research, Carl Cotman reports that “Proving social interactions, exercise, enrichment and diet really do make a significant difference in dogs.” (source) He has cited a study in which dogs enrolled in a 'continuing canine education' class, followed an exercise regimen, and were fed an anti-aging diet high in anti-oxidants. The control group was fed an anti-aging diet, but did not participate in the exercise or continuing education programs. Cotman said the the results were so definitively positive for the group involved in socialization, exercise, enrichment, and diet, that they make a significant difference for dogs.